The flocks of birds that have been recorded in the area of the Nakdonggang River Estuary include 15 Orders, 46 Families and 212 Species; with 58 species of the Snipe Order, 49 species of the Sparrow Order, 33 species of the Wild Goose Order, 11 species of the Crane Order, and the rest coming from less than 5 Species of other orders. Mainly in the spring & fall snipes such as dunlin, red-necked stint sanderling and kentish plovers pass through the estuary. In the summer aquatic birds such as kentish plovers and sea swallows form large groups that propagate on the sandy islands. In the reed-filled areas of the estuary, thousands of reed warblers from the redstart family can be found and in the marshes gallinule of the crake species spend their time eating and resting. During the winter season large groups of winter migratory birds visit the Nakdonggang River Estuary and during this period the estuary has panoramic views that feature the migratory birds sprawled throughout the area. Around January, ducks, wild geese, swans, cormorants, little grebes and sea gulls are at their peak numbers. Among the aquatic birds propagating the Nakdonggang River Estuary, kentish plovers and sea swallows are the largest groups of birds using the deltas and surrounding fields of the Nakdonggang River Estuary. 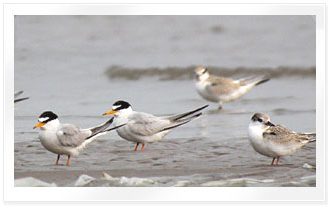 In 1970, more than 100 thousand heads of migratory birds visited the Nakdonggang River Estuary annually. The estuary played a vital role as the only large visiting place for migratory birds on the Korean peninsula, offering a stopover or wintering place for the migratory birds flying from the arctic region downwards towards the south, except for those species residing in Siberia, Mongolia and the northeast part of China. Rapacious birds such as eagles are a rare variety that visit the place, along with steller's sea eagles, ospreys, white-tailed sea eagles, white-naped cranes, storks, blackfaced spoonbills, avocets. In addition to the wintering place for swimming birds, the estuary is the largest wintering place for whooper swans in Korea and the residing place for big wild geese, of which the number of the head is rapidly decreasing. Finally the area serves as the major movement pathway for white-naped cranes.